I love the Blessingway model of celebration and think it’s a beautiful compliment or alternative to our standard baby showers. Started by the Navajo Native Americans, a blessingway is like a shower, but it focuses on the mother instead of the baby. While blessingways were ceremonies designated for all sorts of different life passages in the Native American culture, the most common one still held today is for pregnancy/birthing.Women who are close to the expecting mother all come together in the days before her birthing to bless her with encouragement, prayer, support, and love. There may be prayer, singing, foot washing, or special readings at a blessingway, holding firm to the traditional feeling of a ceremony. Belly casting, bead giving, and henna painting are all common activities with the purpose of empowering the mother for birthing and to celebrate her pregnancy. In my research, I’ve found that many doulas and a few midwives offer blessingway services. They’ll help you organize a blessingway and come run it to ensure smooth flowing from one activity to the next and a positive environment for the participants. Even for people who have never experienced a blessingway before, though, there is plenty of information available on the Internet to help you plan your own celebration. Unfortuntately, I don’t know anyone who has either thrown or been the recipient of a blessingway before. I’d love to hear first hand the effects on a mother-to-be from behind upheld in this very spiritual and joyful way in the days before her birthing! Admittedly, I think the blessingway idea is a little weird. Belly painting? I don't even look at my belly, much less want a cast or it painted. Yup, there's a baby in there, and he's getting big, but I don't see the need to celebrate how big I am. And if someone wanted to wash my feet or brush my hair, I'd think there must be something slightly unstable about them. But that's just me, and I also think baby showers are a little strange. Why have a baby if you can't afford to buy all the stuff yourself? I love buying Joshua things; my registry is going to be very small. But then, I didn't want a wedding shower, either, so I think it's just me. I keep running into first time mothers who seem terrified of the whole birthing process, and I think they apparently watch too much television. I have witnessed two births, and while it wasn't a supernatural, beautiful occasion, it wasn't anything terrifying either. Thanks for sharing a different view. It's always nice to see people interact on topics I write about! Like I said, I think that our local culture has turned the focus of a shower into the monetary aspect instead of being about celebrating the new life, the birth, and blessing the new mother and family. Unfortunately, too many people are invited to showers and, like you mentioned, think of it as “buying all the stuff.” For this reason, we spend time eating, telling birth horror stories, and opening gifts. How much more encouraging would it be for us to instead spend time uplifting the pregnant mother, affirming her and her near birthing experience, and celebrating the occasion! Don't get me wrong, I think gifts are a huge part of this as it's our tangible way to say “I want to bless you,” but the blessing part should be the focus–not the money spent on the gift. And really, I'm not sure anyone can ever afford children. Even if they think they can, an income is NEVER garunteed and can flee at any given moment. I would have ***looooved*** a blessingway while I was pregnant with O! I secretly wanted one, but I doubt any of the people I know in my real life have ever even heard of such a thing. Honestly, our baby shower made me so uncomfortable with all the focus on the STUFF and who spent what. I just tuned out the horror stories. Blah. My sister is currently pregnant with her second child and I'm thinking a Blessingway would be perfect. What a wonderful way to show support and celebrate life! Followed you over from DS 😉 But I just wanted to say I think this is a wonderful idea and I would love to haev a Blessingway. 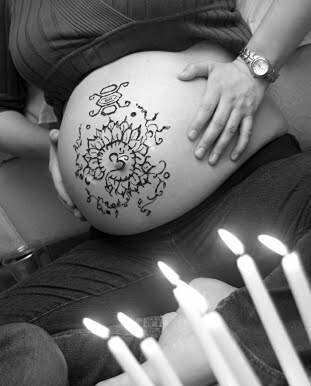 And even if I don't I plan to Henna my belly sometime near my due date. Henna is so much fun! While I understand the desire to share a new life I would prefer to wait until after the baby is born. If women want to sit around and tell horror birth stories at my shower, so be it–I helped deliver a baby in the ER and I've done a delivery in the back of my ambulance, and while neither was a beautiful and spiritual occasion(it just looked bloody, messy and painful), there was nothing that scared me, either. There is a very real possibility that my baby will be delivered at home or in the back of the jeep, considering we have an hour drive to the hospital. We're ok with that. I think people make far too much of the birthing experience. Everyone's birthing experience is different, and I'm really not thinking too much of it. I know some people want a home birth fully natural, surrounded by mothers and sisters and other important women and candles, etc. I prefer a sterile, medical experience with no one but medical professionals and my husband present. Both are equally valid, and both should be encouraged. More than the birthing experience, I want to focus on my child's life and his being raised in a community. What I really like is a baby-naming ceremony, which depending on schedules, we may do in the weeks after he is born. I have had two blessingways, one for each of my children. My sister first discovered these amazing ceremonies when I was pregnant with my first child. She brought together my closest and oldest friends and family members. For friends who couldn't be there, she asked them to send a bead to be added to the birthing necklace. We started by sitting in a circle and my sister and sister-in-law read poems about motherhood. Then each person gave me a bead and shared the reason they picked it for me. After the ceremony, we transitioned to snacks, cakes, and traditional gifts (it was the first baby and I sure did need some supplies). My sister made the beads in to a birthing necklace, and I took that necklace with me to the hospital. I wore it while I was pushing out William. It helped to remind me of the love I was surrounded by and all the women that came before me who had given birth. For my second pregnancy, we had a Family Blessingway so that we could incorporate my son and my husband. We purchased a bookshelf and chose some paint colors. Then we invited close family and friends. A friend led us in a simple opening ceremony where she talked about the transition of becoming parents again and adding another new life to our family. We then broke the circle and had food while we took turns painting on the bookshelf. Now our little girl has an amazing, functional piece of furniture that is covered with handprints, lady bugs, and other things added by our loved ones. It is a daily reminder that we are surrounded by love. I am a huge fan of these ceremonies! Don't be intimidated if you haven't done one before. I promise it is very special for the mother and a refreshing alternative to the usual (often silly) games that can come with a more traditional baby shower.